A warm welcome awaits you at The Townhouse offering you superb accommodation in heart of Miltown Malbay famous for traditional Irish music and ideal located to tour around Clare and the Wild Atlantic Way. br / br / br / br / Resting amidst gorgeous rural landscape in the atmospheric town of Miltown Malbay The Townhouse affords guests outstanding accessibility to County Clare and the wild Atlantic way. Notable attractions such as Cliffs of Moher The Burren Bunratty Castle Folk Park Aran Islands surfing the west coast and Loop Head Light House are situated within the surrounding area. Proudly owned and run by husband and wife Keith and Christina Elements B&B is a purpose built property situated in beautiful tranquil countryside with views of Slieve Elva. We are just a ten minute walk from the Victorian spa town of Lisdoonvarna offering great food and drink and both traditional and contemporary music famous for its Matchmaking Festival and Slow Food Festival. Ideally based for trips to The Cliffs of Moher The Burren The Wild Atlantic Way Doolin Cave Doolin Harbour and The Aran Islands. A great location for walkers looking to explore the unique Burren landscape. br / br / br / br / Each of our six rooms are en-suite with power shower and complimentary toiletries and have flat screen TV tea and coffee making facilities hairdryer free bottled water and homemade biscotti. All rooms have blackout curtains and very comfy memory foam topped beds to ensure a great nights sleep. You can also relax in our lovely guest lounge with leather sofas cosy open turf fire large flat screen smart tv dvd cd books and games. We also provide free WiFi throughout and free off-road parking. br / br / br / br / What better way to start your day than with one of our excellent Full Irish breakfasts - cooked to order using fresh locally sourced ingredients. Enjoy our homemade Irish Soda Bread served with a selection of jams from the nearby Clare Jam Shop great with a mug of freshly brewed coffee or a pot of hot Irish Tea. We also have a selection of teas and a plentiful supply of chilled orange juice. If you fancy something a bit different we offer American Style Pancakes with mixed fruit chocolate chips maple syrup or Nutella omlettes with your choice of fillings and porridge. If you prefer something a little simpler we offer boiled eggs and toast scrambled eggs a selection of cereals fresh fruit and natural yoghurt. Gluten Free options are also available. Whatever your choice you won t leave hungry! Riverside Bed & Breakfast is located near Trump Golf course. We are a short drive from beaches, pubs and restaurants. Car ferry to Kerry is 20mins drive, Shannon airport is 50 mins drive, we are 40mins drive to Cliffs of Moher, we offer a choice of rooms. Armada Hotel enjoys an enviable seafront location overlooking the Atlantic Ocean. When staying with us you can experience our fresh new 86 contemporary bedrooms which include superior signature and tranquility room that you can enjoy relax and unwind. Through the sheer quality of warm welcomes excellent service and fine cuisine the Armada Hotel bring prestige back into our modern world. Dine at the 1940 s themed restaurant where you can indulge in gourmet fine dining overlooking the Atlantic Ocean. The Ocean Bar is the perfect retreat for a relaxing coffee and a popular choice for carvery lunch served 7 days a week. Round off your evening with a visit to the Flagship bar where you can meet the locals or enjoy a pint with some foot tapping music each weekend. 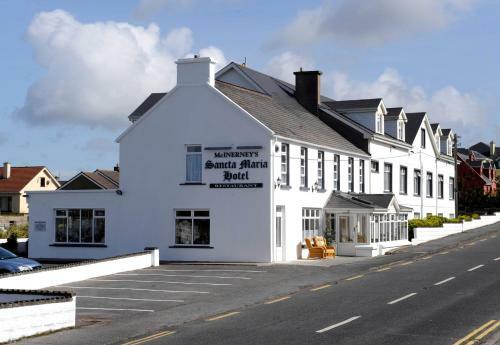 The hotel is only a short driving distance to the renowned Lahinch & Doonbeg golf courses and to some of Ireland s most popular visitor sites to include the Cliffs of Moher the Burren and the Aran Islands. We are a B & B located in the centre of Kilronan. We are a 10 minute walk from the harbour and we re a stone throw away from Joe Wattys Bar & Restaurant.The B & B is a family run business the main proprietor Bartley was born and raised here on the island. Cl?? B?n is known for it s prime location views of Galway Bay and the Clare coast. The island of Inis M?r (Inishmore) meaning the big island is one of the most popular tourist destinations in Ireland. br / br / br / br / It is Well known internationally with over 50 different monuments of Christian pre Christian and Celtic mythological heritage. There isn t far you can go before being somewhere where there s something of historical interest and little reason to question its importance in modern Irish Culture. Ferries to the Aran Islands are available from Rossaveal (leaving Galway city) all year and from Doolin (Cliffs of Moher) from April to October. br / br / br / br / You can book a room via our website or by phoning us on 099-61111 or emailing us via claibanhouse gmail.com. Unfortunately we do not take bookings on Facebook. All of our rooms are en-suite with tea/coffee facilities and televisions. The rates are generally 35 - 40 per person per night sharing and 50-70 per night single rate. br / br / br / br / We only accept Offline Payments by Cash or Cheques. 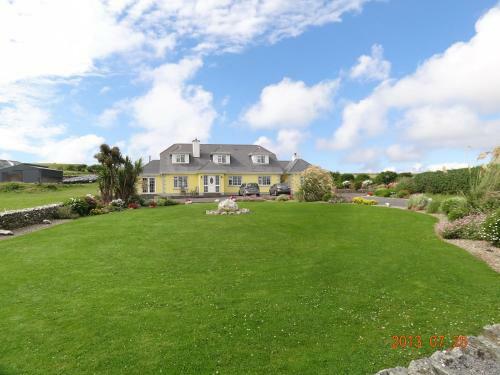 Spanish Point House in County Clare is the perfect location for outdoor activities such as walking cycling and surfing and for golfing enthusiasts we are ideally situated to take advantage of some beautiful golf courses. Just a fifteen minute drive from Spanish Point House is Trump Doonbeg Golf Links which has recently been redesigned by Dr. Martin Hawtree and it offers spectacular golfing surrounded by breathtaking scenery. 10 minutes away is the wonderful links Championship course at Lahinch. There is also the world famous links course of Ballybunion Golf course in County Kerry to be considered one of the top ten courses in the world! A regular ferry from Killimer Co.Clare crosses to Tarbert Co. Kerry and the crossing takes approximately 20 minutes. Dromoland Castle hosts a very enjoyable 18 holes the lush rolling tree lined landscape that drains into Dromoland Lough with the Castle as a backdrop. br / br / A twenty minute coastal drive from Spanish Point House brings you to the world famous Cliffs of Moher and O Brien s Tower which stands proudly on a headland of the spectacular Cliffs. The Aran Islands Galway Bay as well as The Twelve Pins the Maum Turk Mountains in Connemara and Loop Head to the South can all be views from the Cliffs. br / br / br / br / Surfing at Spanish Point is an exhilarating experience and Clare Surf Safari is a mobile surf school tailoring to suit couples or smaller groups of up to five guests and offers a complimentary transfer to and from Spanish Point House for all our guests. br / br / The local town of Miltown Malbay home of traditional music and the world famous Willie Clancy Festival is just a 2 minute drive away. The town offers a good choice of dining options and pubs. Just a 12 minute drive away Trump s serves a selection of hot & cold dishes and an array of craft beer on tap as well as the old reliables. br / br / Ten minutes from Spanish Point House is the quaint seaside resort of Lahinch again offering a fine selection of restaurants & bars. Sheedy s Country House Hotel offers an idyllic escape with beautiful gardens and award winning cuisine in an unrivalled location on the edge of the Burren. This 18th century house has true character and an intimate atmosphere. Each of the beautiful bedrooms and suites have been individually designed with comfort in mind. As well as being the perfect base for golfers with Lahinch and Doonbeg only a short drive from the hotel Sheedy s location in Lisdoonvarna makes it ideal for exploring the Cliffs of Moher which are just a 10 minute drive away the Aran Islands Ailwee Caves and the popular village of Doolin famous for great traditional music. John Sheedy s cooking using local fresh ingredients has been awarded two RAC Dining Awards. Georgina Campbell Guide - Best Breakfast in Munster 2004 award. Highly recommended by Fodors the Good Food Guide the Good Hotel Guide and the New York Times. 2 AA Rosettes. One hour from Shannon Airport. Atlantic View B&B is just 1 km from the famous Cliffs of Moher and has panoramic ocean and countryside views. 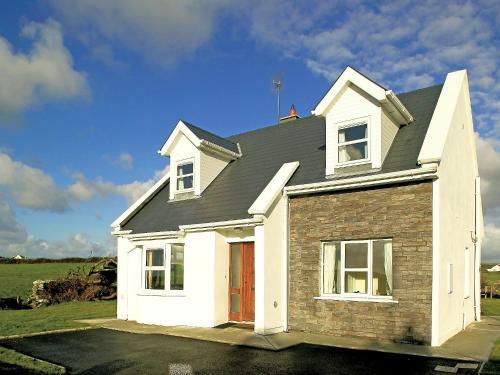 It is 3 km from the famous Lahinch Golf Course. 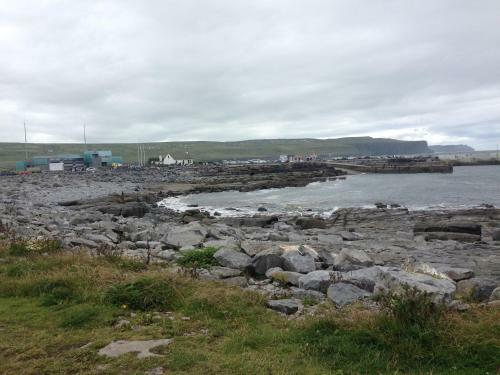 Offering a children's playground, Liscannor is situated in Liscannor. Cliffs of Moher is 5 km away. All units feature a TV. There is also a kitchen, equipped with a dishwasher and oven. Every unit features a private bathroom with a bath or shower. 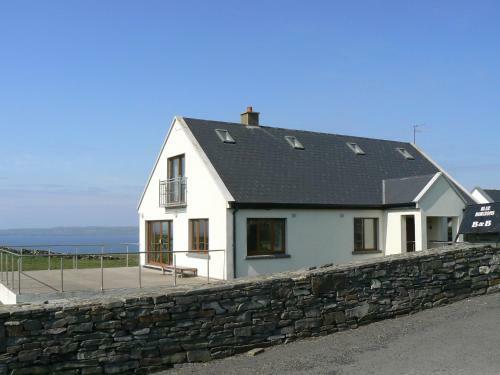 Set in Liscannor in the Clare Region, this detached holiday home is 5 km from Cliffs of Moher. It provides free private parking. The kitchen has an oven. A TV is featured. 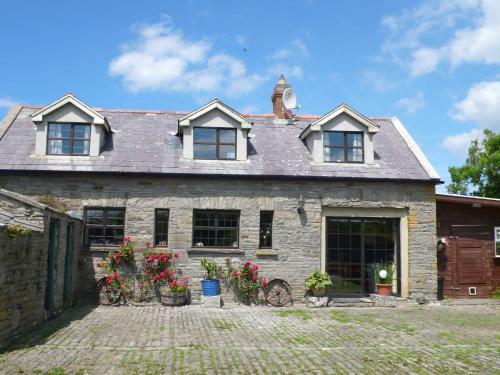 The Coach House Liscannor is a 100-year old stone built detached holiday home near the sea. 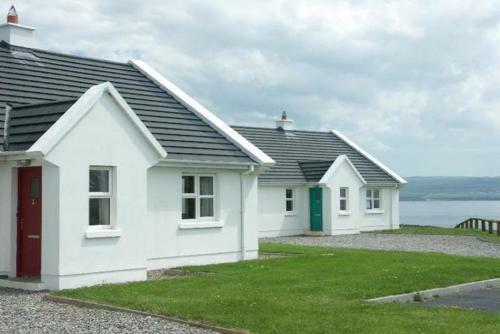 Offering free private parking and WiFi, the holiday home is 5 km from Cliffs of Moher. In the coastal village of Liscannor, the Cliff Cottages are within a 7-minute drive of County Clare’s famous Cliffs of Moher. Around 30km from the Burren National Park, each 3-bedroom cottage has free parking and accommodates up to 5 guests. Vaughans Anchor Inn is located in the fishing village of Liscannor, 2 miles from the Cliffs of Moher and within 5 minutes' drive of the famous golf course and beach of Lahinch. Tides Apartment Liscannor offers accommodation in Liscannor, 5 km from Cliffs of Moher. There is a seating area, a dining area and a kitchen complete with an oven, a toaster and a fridge. There is a private bathroom with a shower. The Cliffs of Moher Hotel is situated in the picturesque fishing village of Liscannor in North Clare on Ireland's western Atlantic shore. The village is on the southern edge of the Burren in County Clare, near the cliffs of Moher. 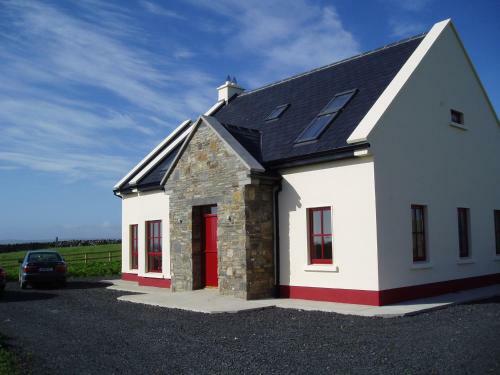 Rose Meadow Cottage is a holiday home located in Liscannor, 3.6 km from Cliffs of Moher. Guests benefit from free WiFi and private parking available on site. There is a dining area and a kitchen. A flat-screen TV is offered. Situated within 2 km of the Cliffs of Moher, Island View Bed and Breakfast features free WiFi access and free private parking. The rooms include a private bathroom equipped with a bath or shower. There is a shared lounge at the property. Situated 8 km from Doolin Cave in Doolin, B&B Ocean View features free WiFi access and free private parking. The rooms have a flat-screen TV and DVD player. There is a shared lounge at the property. Located in Miltown Malbay, 30 km from Ennis, Journey's End features free WiFi access and free private parking. Some rooms feature a private bathroom with a hot tub, while others have slippers and free toiletries. With spectacular ocean views, Blue Horizons B&B lies on the County Clare coast, between Spanish Point and the Cliffs of Moher. 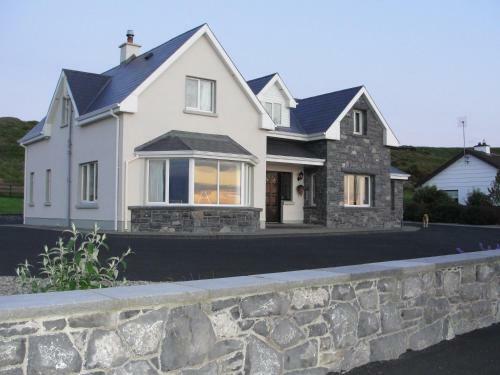 On the Wild Atlantic Way driving route, this guest house offers free on-site parking and WiFi. Featuring free WiFi, Teach Cois Tra offers pet-friendly accommodation in Miltown Malbay. Free private parking is available on site. Each room includes a flat-screen TV. Some rooms feature a seating area where you can relax.